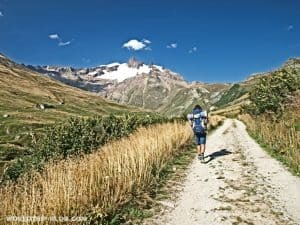 170 km, 10.000m of ascent and hiking through 3 countries in a breathtaking scenery, the Tour du Mont Blanc is one of the world’s greatest hiking trail. I’m thrilled. I’m standing right now at the finisher line of the world famous ultra marathon in Chamonix, France. The first women is running over the finisher line. She smiles and can’t believe that she won the UTMB for womans. She run 170km, 10.000m of ascent and descent in around 23 hours and she’s still smiling. I can’t believe it. I’m overwhelmed. She looks so good that I thought she just started one hour ago. I’m impressed and that picture branded into my brain. I was looking forward to do this trek in around 7 to 10 days and this woman did it in 23 hours. Wow. The next days I thought a lot about that picture but that I didn’t know at this moment. 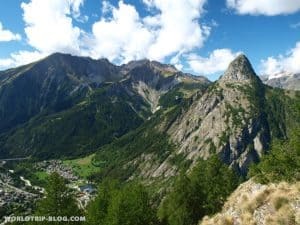 A friend of me, who just came back from a 2 year world trip and I started the next day this world class hiking trail in Les Houches, just south of Chamonix, France. 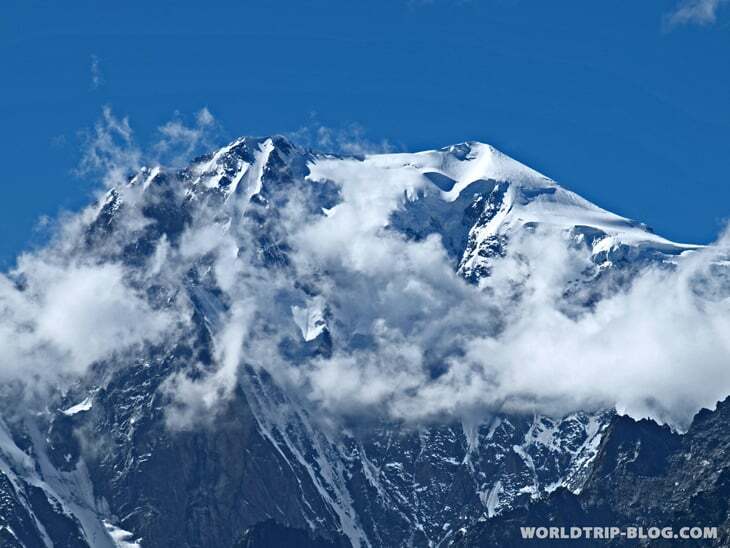 All around us are the soaring peaks of the Mt Blanc massif. Open-mouthed we’re walking the first ascent of one of the world’s greatest walks. Our backpacks with tent, sleeping bags, thermarests and food are way to heavy. Looking back I would never again carry 16kg of a backpack 10.000m of ascents and descents in the Alps. 🙂 But that I didn’t know at the moment either. So we walked hours and where totally amazed of the incredible scenery around this Mont Blanc massif. Along the way you can buy very tasty cheese. The first night we spent at a church of les Contamines. You have to walk through les Contamines along the river and before you walk the next big ascent there is a small church with picnic tables where you can camp. At the end of that day I had my first big blisters. What a good preparation for the next following days. Ha ha. 🙂 If you want to stay in some hotels or B&B there are a lot available in les Contamines, 1180m. After a great oat meal breakfast we head up the next mountain to Col de la Crois du Bonhomme 2479m and had an amazing view over the mountains. 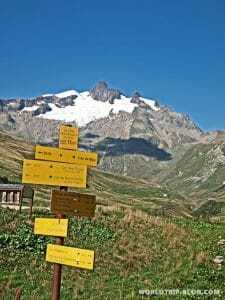 At this day we walk close to the refuge des Mottets, 1864m and put our tent on in a breathtaking scenery. We had the best view to the massive glaciers. We expected a very cold night in the tent. If camping is not your thing you can easily sleep in one of the refugees or in hotels and B&B in the mountain villages. 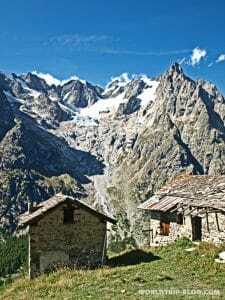 I set up a list of the refugees, B&B and hotels along the trail in my travel magazine of the tour du Mont Blanc. The third day of the tour du Mont Blanc was the hardest. In every aspect. We hiked up in sunshine to the Col de la Seigne 2516m and than the weather changed very fast. It was ice cold on this peak and we didn’t want to make a break. Then we head down to the Alpe sup. de la Lée Blanche, 2205m and it started to rain. Now we’re in Italy. The scenery was still incredible. We felt like we’re in a movie of the lord of the ring saga. Get my free tour du Mont Blanc photobook here and see it yourself!. We had a lot of fun to make some fascinating pictures of this engrossing landscape. Our food was gone at this moment and we thought to eat some pizza in the next Italian mountain village. The descent in the heavy rain has demanded us. It was slippery and my knees and blisters where burning. The only thing what let me still walk was the picture of the Italian pizza. I could almost taste it. I don’t know when I was so happy to see a village before, but Courmayeur 1223m was directly in front of us and we made it. At this descent I almost died, but this is another story. So we head directly to the next Italian pizza place. The pizza was amazing. I can still taste this pizza how the cheese melt away and I got back my life energy. In this night we just put our tent on the next possible place in the village and felt asleep. On our 4. Day we did it easy. We started the day with a good Italian espresso. I bought some plaster and disinfection spray because my blisters where already bloody and my knees where still burning. So I bought some hiking sticks to relieve my knees. That decision was one of the best ones in my life. I’ve never used some hiking sticks before but otherwise I’m sure that I could never finished this trek with my burning knees. The hiking sticks helped me to keep walking. And of course a relieve for my mind too. It’s all about the mind. Isn’t it? This day was our highlight. It was breathtaking. The weather was just perfect and we had the best view to the Mount Blanc on our entirely tour. Did you know that there is a mountain similar to the Machu Picchu mountain? No, me either. But look at the pictures and tell me what you think. It was an amazing day. The Machu Picchu mountain is called Mont Chetif. On it’s top there is a statue of Marie protecting us. You can hike up this mountain too. Half of the walking time we where taking pictures. Many of them you’ll find in my free travel magazine of the tour du Mont Blanc. It was incredible. And the Mount Blanc where directly in front of us. Awesome. We just thought to climb that monster too after our tour but that was just a glimpse of a thought. Driven by serotonin because of the fantastic landscape. We walked over the Rifugio Bertone 1970m until the Rifugio Elena, 2061m. We had a ice cold night but slept with a big smile on our faces. On the 5. Day we head up to Grand Col Ferret 2537m and crossed the border from Italy to Switzerland. In Switzerland you have very nice small houses with great shutters. Our plan was not to stay long in Switzerland because we couldn’t afford the very pricey prices in every aspect. So we walked all the way to Champex-au-Lac 1456m. It is a great small mountain lake and has a small supermarket, where you can buy your food when you don’t want to go in very pricey restaurants. (around 7€ for french fries) We camped in the forest close to the lake. The 6. Day of our tour du Mont Blanc we got up early. I went to the ice cold lake for a morning swim. After that I was awake and we could start to hike. After a few kilometer the pain in your feeds are gone. Don’t stop to walk and you’ll be fine. 🙂 The weather changed and it was very cold. We hiked from Champex-au-Lac 1456m to Herbagères, 2033m. We had an awesome camping place. The valley lay below us and we had a great view over the mountains. But on 2033m the night was ice cold. My friend had only a summer sleeping bag and so I think he could not close his eyes in this night. In the morning on our 7. Day there were the first snow flakes coming down. We couldn’t see anything because of the fog. 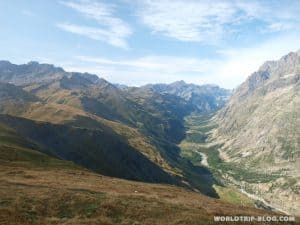 We hiked up to Col de Balme, 2192m and search our way down to le Tour, 1453m and then we took a hiking trail back to les Houches, 980m. 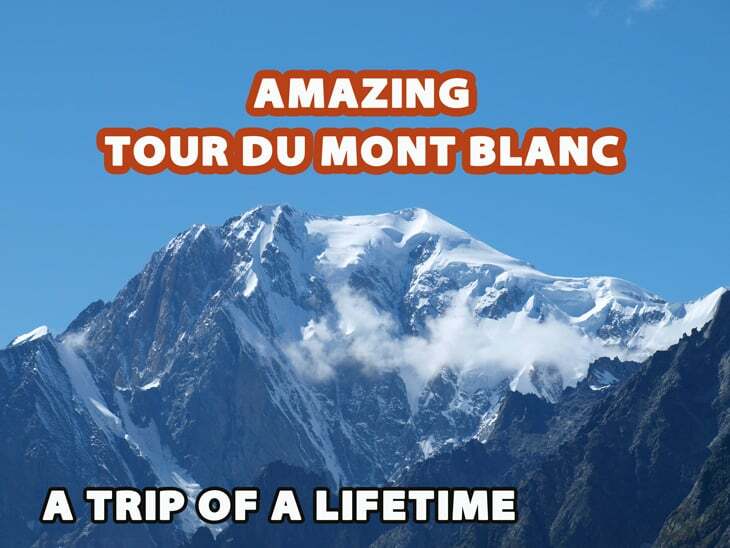 We did this amazing tour du Mont Blanc. We where so happy. I still can’t believe what a magical landscape that the Tour du Mont Blanc has to offer. Not to say the amazing food what you can taste along the way through 3 different countries. I would definitely do this tour again, but with more money and with only half of my backpack weight. But maybe we see us on top of the Mount Blanc or on the trail of the famous ultra marathon UTMB again. 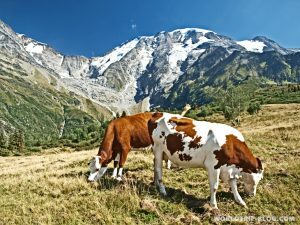 I wrote a travel magazine to get some useful informations, attitude profile, photo book and how to get a free Tour du Mont Blanc map. You can get it here for free! Cheers. Enjoy it. Safe travels to you!